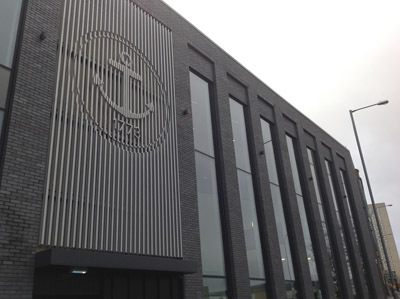 Assay Office Birmingham wanted a bold Anchor – the AOB’s long-time emblem – to stand proudly on the front of its new building. The design brief was something not too traditional – instead, a little more abstract and to look like an integral part of the building, while also having a sense of movement. 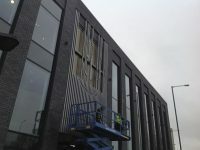 The resulting design was the fruit of ideas shared by the building’s architects and Steering Group, who came up with an anchor motif created in aluminium spines with cut outs, so that as you walk or drive past the building, the anchor seems to gently move. 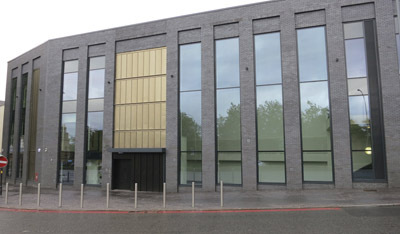 The design also gives the impression of being ‘stamped’ into the front of the building. The anchor was crafted by fabricators in Hereford and is made from extruded aluminium to keep it lightweight. 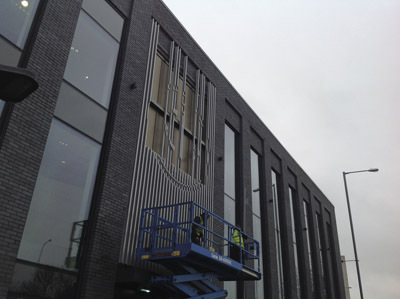 It measures a total of 8m tall x 4.5m wide, and stands above the Moreton Street entrances to AOB. It also took four days to install. Also present on the door are hallmark symbols. Of note: MB for Matthew Boulton, Lion passant for Sterling Silver, Anchor for Birmingham, A for 1773.